After last year’s inaugural WSAV Blitz Border Bowl, both the Georgia and South Carolina All-Star teams were excited to prove themselves at the 2nd annual game, which took place last Saturday, January 12th at Memorial Stadium in Savannah. Team Lowcountry of South Carolina was especially out for blood after last year’s loss. Georgia’s 2018 team was coached by Richmond Hill High School’s Matthew Lezotte, and the South Carolina team was coached by Bluffton High School’s John Houpt. The Coastal Empire team of Georgia won 15 to 3 in a relatively slow game, during which there was just one touchdown by the Coastal Empire. This year, the game, which serves as a fundraiser for the Ronald McDonald House, left little to be desired by high school football fans, who watched the All-Stars explode on the field. Georgia scored on only their second play of the game, multiple interceptions were made by the Lowcountry, and jarring tackles were made by both opponents. Georgia’s All-Star team was coached by Islands High School’s Rob Zoller, and was favored to win, with Kalen Deloach, an Under Armour All-American, and West Virginia University commit Winston Wright both hoping to bring home another victory for the Coastal Empire. The stacked Georgia team also had players hailing from Liberty County, Statesboro, New Hampstead, and Richmond Hill, all players who were itching to win the last game they may ever play together. However, May River High School’s Rodney Summers and the Low Country team rallied at the end of the game bringing home a 35-34 win against the talented Coastal Empire team. In the last quarter, Pernell Maxwell of Wade Hampton High School and John Swinton of Bluffton High School made touchdowns, winning the game for Lowcountry and bringing the record of the Blitz Border Bowl games to 1-1. 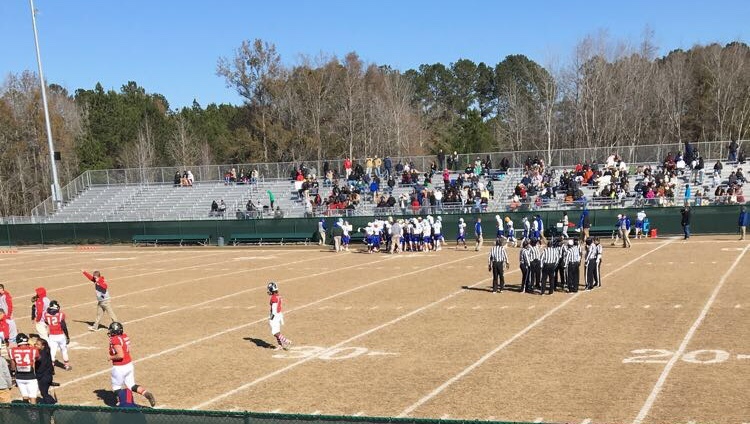 The underdog team from South Carolina showed up and showed out for the game, a result of their football players’ competitive nature and two groups of talented seniors playing their last game of high school football ever.